Naples and I were not immediate friends. When I first visited 20 years ago in a study abroad class, we were so severely cautioned and tutored against the city’s supposed criminality that we didn’t get to explore much. What we did see didn’t really appeal to me; I guess I was more of a Northerner, character wise. 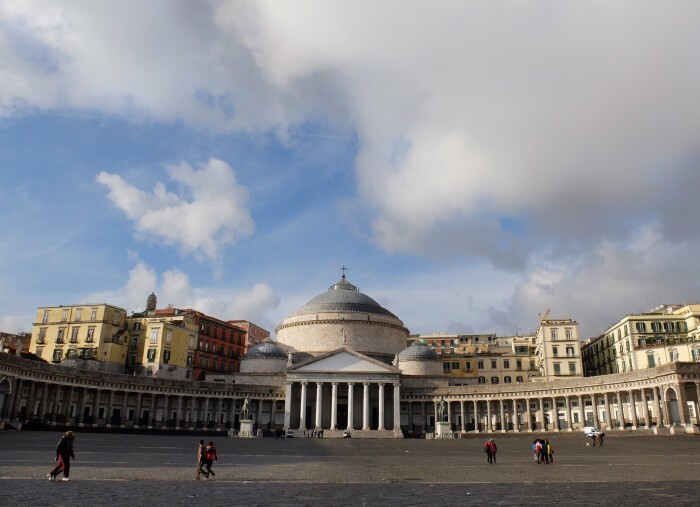 I returned a dozen years later leading my own study abroad group, with a desire to better understand why Naples is so problematic, but no particular love for the city. Only in recent years have I been back with a bit more leisure to explore the city with the excellent guides of Context Travel, with whom I’ve now taken two tours of Naples. I also think I’ve grown into the city by becoming more Italian – more open to “casino” and more appreciation for different kinds of beauty (and food!). On this last trip I found that there are so many things to do in Naples Italy that one could easily spend a week here. From delicate Renaissance sculpture to gritty narrow streets, Baroque wonders, flavourful pizza and grand palazzi, here’s my guide to Napoli. The best thing that happened to me on this weekend trip to Naples, except maybe that last pizza, was Fiorella Squillante. A name like a novel, a head of black curls and a voice that sings with energy and love for her native city. She was to lead the walking seminar we signed up for, Context Travel’s La Vita Napoletana. The tour’s description doesn’t promise much – a few castles and a primer on the city from Roman times to now. Don’t be fooled. Without entering into any museums or necessarily any famous churches, Fiorella not only gave us a great base with which to approach the city, she also left me with a long list of further things to see (and reasons to see them) to complete our weekend – and plan some return trips. Below is some of what we saw with Fiorella and some was latter “homework”; I’ve also incorporated something from past trips. We started off our day at the historic and very fancy Gambrinus bar, right near the Palazzo Reale (the bar is where they bring visiting presidents!). The Palazzo was built in the early 17th century, while the church in front of it, which echoes St. Peter’s in the Vatican, dates to 1816. We didn’t go inside either large structure; rather the point of starting here was to introduce the “thesis” of our walk with Fiorella – that Naples is a city of strong contrasts. Clinging to the hill that rises up behind the church is the Pallonetto area, one of the worst in Naples. We walked through a part, with windows opening at knee height, no urban planning, unhealthy and moldy construction; then we deek back down at a point beyond which Fiorella says is drug-dealing land. We had arrived at piazza Plebiscito by walking down the long and wide via Toledo. Lined with somewhat cheap shops, this wide boulevard cuts through Naples, with the ill-famed Quartieri Spagnoli on one side and the historic center on the other. A few hundred meters to the south, I’m almost surprised to be on the coast and to smell the warming sea air. Between Pallonetto and Castel dell’Ovo, a promontory sticking out of the city, is Monte Echia, and this part of Naples is its first Greek settlement called Parthenope. 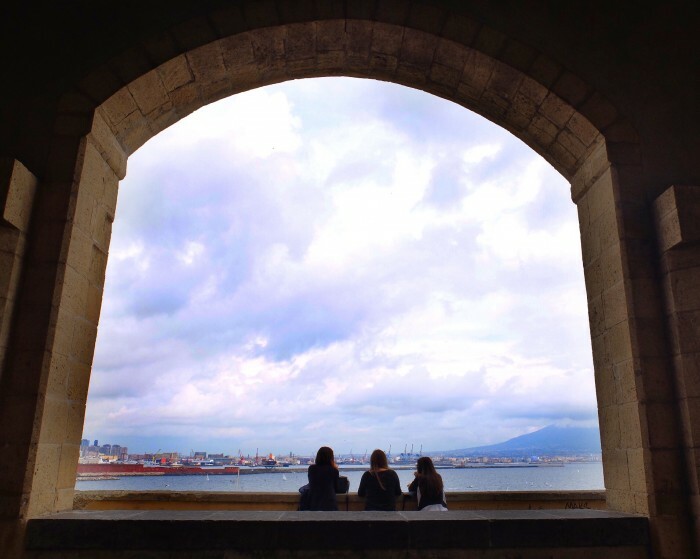 The Castle, which is free to visit and provides an incredible view of the gulf of Naples. The islet of Megaris has history as a first-century pleasure villa of the Roman general Lucullus; it was later a monastery and then a castle. Surrounding it are some bars, restaurants (quite good, apparently) and some random housing – this was a fishermens’ settlement, and some original owners still hold fast amongst the otherwise gentrified homes. The Greek settlement, Neapolis, dates to the 5th century or earlier. You can spot it on a map as the regular cross-streets of the part generally labeled as the historic center. Down its very middle is the crowded tourist street, Spaccanapoli (actually called via Benedetto Croce and via San Biagio dei dei Librai). Packed with churches, if you have time, head into San Domenico Maggiore, whose important monastery and library attracted both St. Thomas Acquinas and Giordano Bruno. Caravaggio’s Flagellation, now at the Capodimonte Museum, was located in a chapel here; an Annunciation by Titian has also been moved to the museum. While in central Naples, don’t miss the famous Christmas Street, San Gregorio Armeno, where it’s Christmas all year round. In December, this street gets so crowded that pedestrian traffic is limited to one direction. Here you can see the very important tradition of presepi (crèches), including some historic examples. 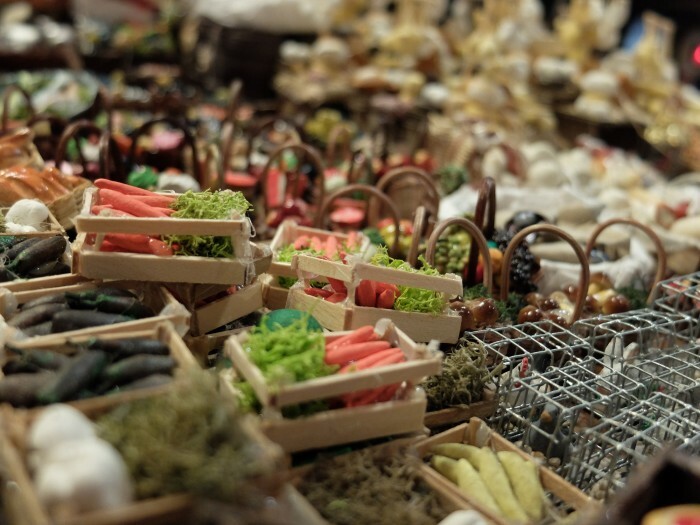 Some of the teeny tiny objects you can put in your nativity scene! Between the center and Capodimonte – one of the three hills of Naples – is an area called Quartiere Sanità (named for the fact that it was “healthy” to live there as it was once full of trees). The large boulevard that runs from Palazzo Reale up to Capodimonte (the summer residence of the Bourbon Kings) runs through the Sanità, and to ensure an attractive procession, it was lined with nice palazzi and churches. Fiorella took us to visit this area, where she’s chosen to live. It’s in a pre-gentrification phase but has a lot of potential in these grand 18th-century buildings, especially those by the architect Ferdinando Sanfelice. 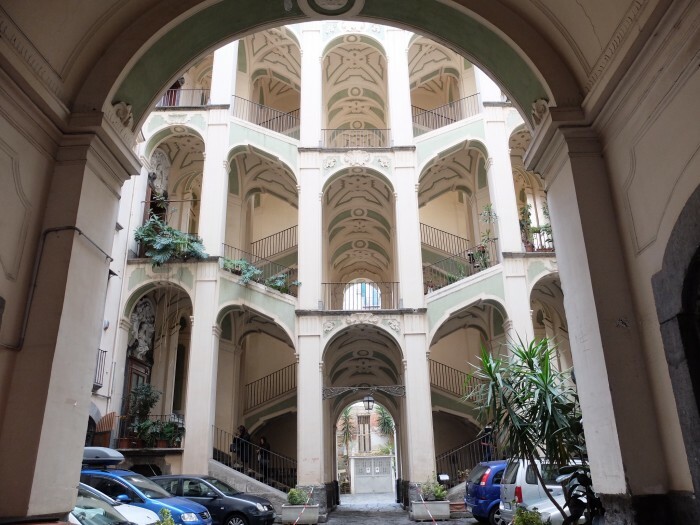 Palazzo dello Spagnuolo is the prime exponent, with a grand double ramp interior stairwell that the architect also used for his own home and that of his servants (just further down the same street). When I first came to Naples as a student, I was in a fabulous 6-week traveling Renaissance art class with Syracuse University. We visited Florence, Rome, Naples, Venice, Urbino, Ravenna and a few things in between, always in search of “things Renaissance” – even in places less known for this period. 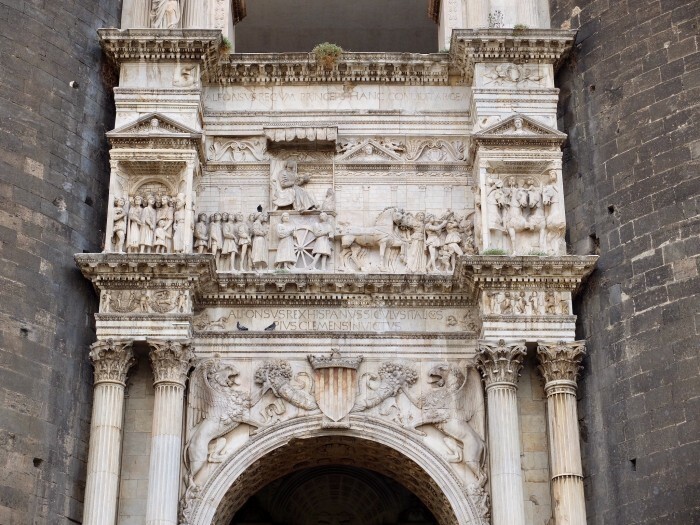 Hence, one of the first things I saw in Naples was the sculpted triumphal gate of the Maschio Angioino, a late 13th-century fortified castle commissioned by the French King Charles of Anjou. Giotto was hired to paint areas inside in 1328, though sadly, only a few fragments remain. Always a visual testimony to changing governments, when the Aragonese Kings conquered Naples in the middle of the 15th century, they commissioned a delicate, light marble entryway by Florentine artists that stands in contrast with the massive defensive structure. The Florentine style never quite caught on in Naples, but it was appreciated by foreign rulers and Tuscan diplomats who commissioned primarily tombs from Florentine artists. 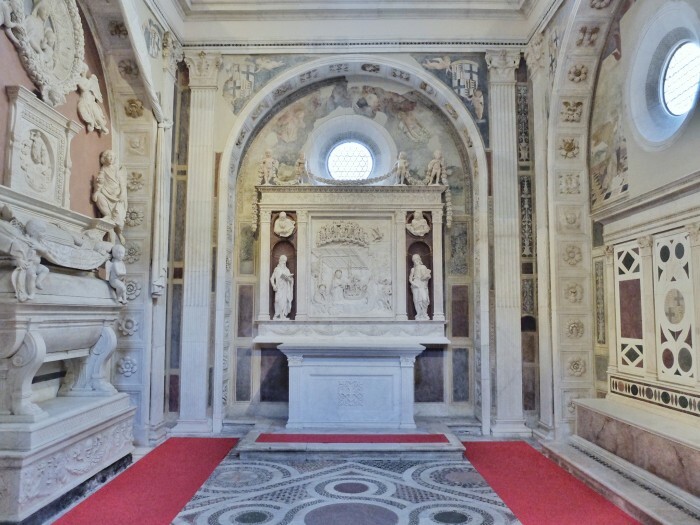 Renaissance geeks like me will hence want to visit the church of Sant’Anna dei Lombardi, where the Piccolomini family’s (yes, the same as commissioned the library in the Cathedral of Siena) tomb was sculpted by Benedetto da Maiano and Antonio Rossellino. The church is more famous for a room decorated by Vasari, which I opted not to see (not a huge Vasari fan…). Another Renaissance destination that Fiorella recommended (but that I have to save for a future trip) is the church of San Giovanni a Carbonara, where there are 15th-century frescoes and sculptures. Caravaggio came to Naples with a price on his head. He worked in constant fear of being discovered and killed. Leaving only three works in the city, his impact on Naples and its artistic style was felt for decades. Context Travel has a tour on Caravaggio and the Baroque in Naples which I have written about in detail here. 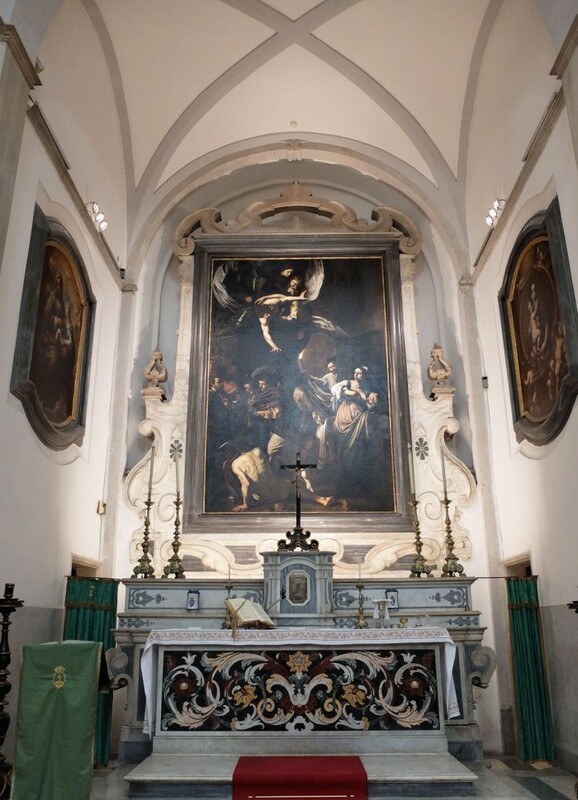 If you can only see one Caravaggio in Naples, I suggest the one in situ, at the Pio Monte della Misericordia. In 1607, they asked Caravaggio to paint the seven corporal works of mercy that they helped carry out in their own city over the seven altars of their church. In a show of mastery, the artist said he could easily fit all that into one canvas. The result is much more harmonious than you’d think considering how much he had to express in that space. 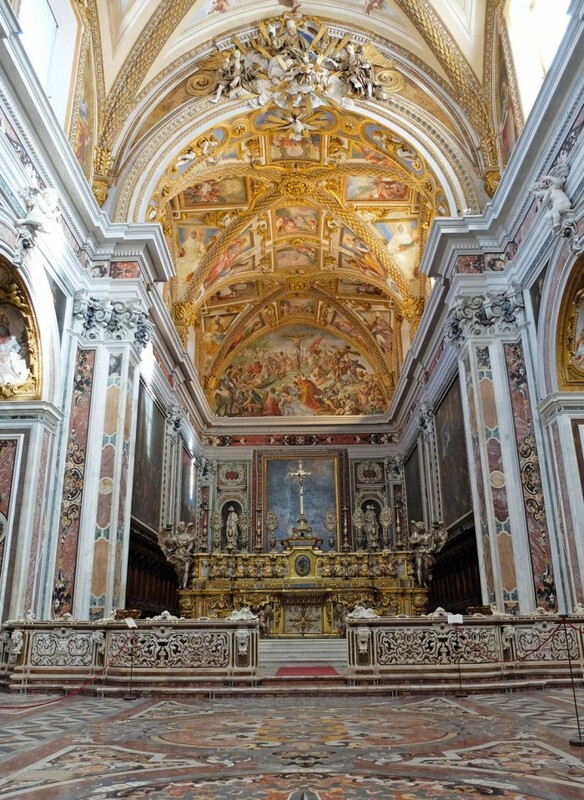 The most spectacular place to take in the full impact of the late Baroque style in Naples is probably the Certosa of San Martino, high up on the hill above the city. The Carthusian monastery was one of the richest of the city, attracting its best artists. Now a large museum, you can visit room after decorated room and marvel at the wealth. 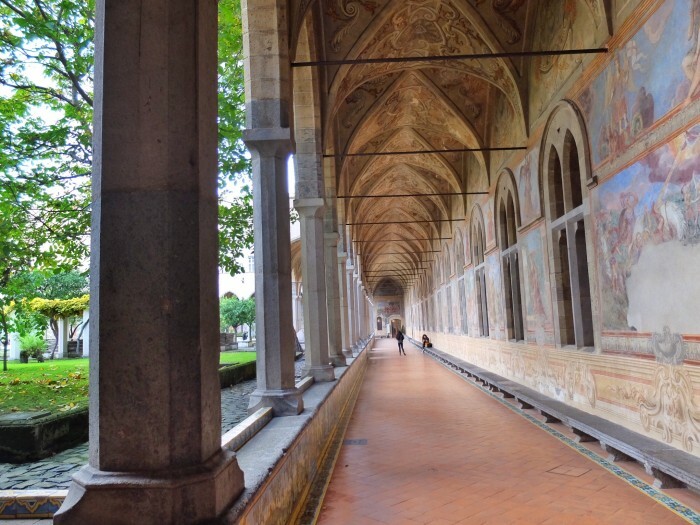 Another important monastery to visit is that of Santa Chiara, smack in the middle of the city. Founded in the middle ages, it has a most spectacular cloister that was used by the clausura nuns. The Angevin King and Queen commissioned this unusual double monastery in the 14th century. 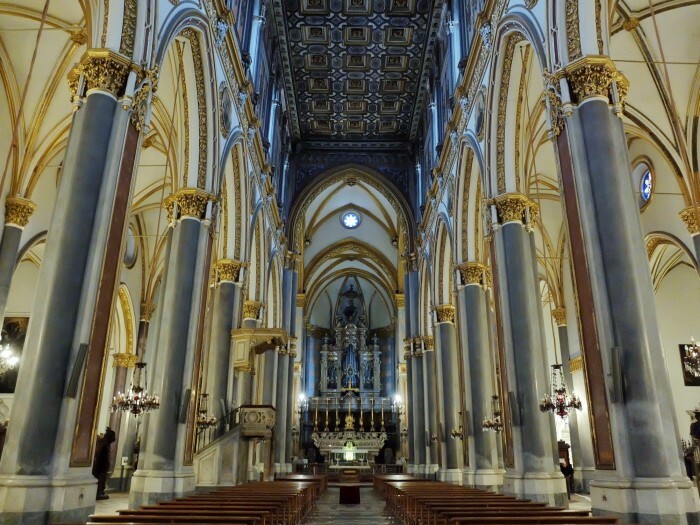 Around a single church (destroyed in WWII) was a Franciscan monastery and a convent dedicated to St. Claire of Assisi. The two bodies were completely separated, and the women had the most extraordinary space to make up for being in clausura, it seems. 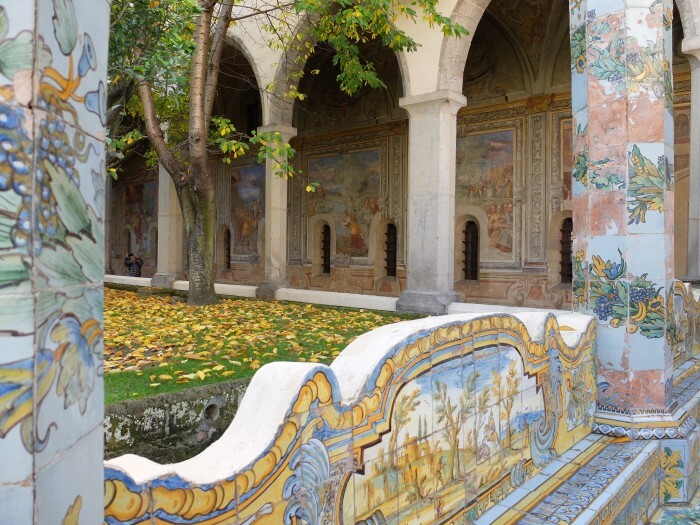 A huge cloister with frescoes from the 17th century was decorated with sitting areas in historiated glazed maiolica in the 18th century. Between columns with foliage decorations are benches with bucolic scenes that must have keyed up memories of happier times outside of the city – only one scene refers to convent life, showing a nun feeding rather large cats that look almost like panthers. The 6 euro entry ticket here is well spent, as the complex has a QR code info system, an archaeological area (they’ve dug up Roman baths) and nice bookshop/bathroom/bar area. If you haven’t been to Naples before, a few places not on my list probably should be on yours. The two major museums are the Capodimonte for painting and the Archaeological for an impressive collection of Roman statuary, frescoes and mosaics. The latter is unfortunately very badly kept, while the former has flourished under the new government’s independent management program; its French curator has also been working on opening up and making pleasant the adjacent park. The top tourist attraction in Naples is probably the Veiled Christ, which I haven’t bothered to see because it is probably the only place with a line up that isn’t a pizzeria. And then, of course, there’s the Duomo, a masterpiece of Baroque art (I mention it in my Caravaggio and Baroque article). Naples isn’t a big contemporary art destination, but there are two super things to see if you do want a modern dose. First are the “art stations” – the Metro stations with commissioned contemporary installations or directly designed by important architects. When you arrive at the central train station, admire the Garibaldi metro stop with a fantastic bank of escalators that criss-cross a central area, designed by the French architect Dominique Perrault. 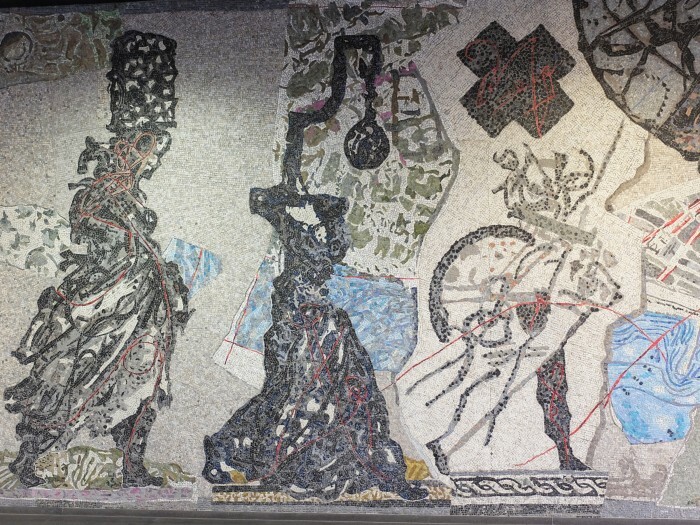 Toledo is most peoples’ favourite stop, by Spanish designer Óscar Tusquets Blanca and with a mosaic designed by William Kentridge. Dante station was designed by Gae Aulenti, a bit more austere than many others. Vanvitelli, if you head up to the Vomero area, has a really neat installation by Mario Merz with the series of Fibonacci numbers in it. The other destination in Naples for contemporary art is the MADRE museum, with both temporary and permanent collections. 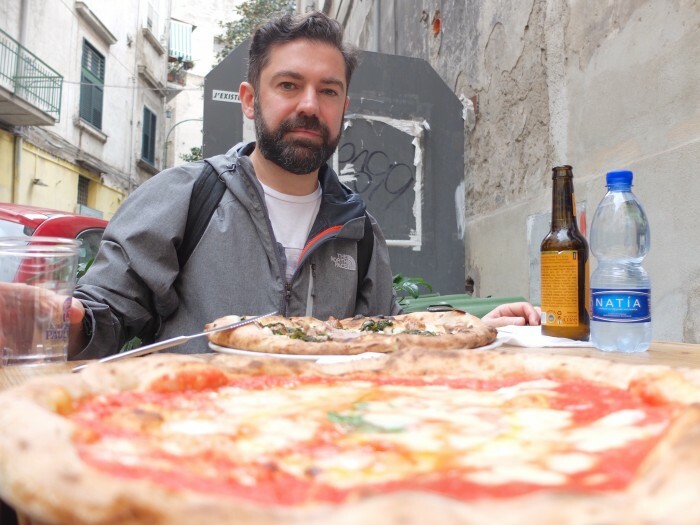 No article about Naples would be complete without a mention of the food, which really does make up an important part of the experience. I feel like I must return because in a few days you just don’t have time to eat as much as you’d like. Friends of ours last year went on a “pizza tour” – a die-hard, scientific tasting of pizza for lunch and dinner. We followed their results, published by Michela on her blog (article in Italian), though only had time for two pizzas. Not a fan of waiting hours in line, we eschewed the most famous pizzerie in town and followed the stomachs of our friends. We agree that Spicchi d’Autore in the Vomero area is absolutely divine, and quite light – light enough that we also ordered a “bombetta”, a fried dough filled with sweet ricotta and lemon zest. We also tested Concettina ai Tre Santi in the Sanità area, where, however, we didn’t sit down inside but went to the “street food” side – a super tip… most of the famous spots have a take-out side where you can get faster service, and in this case there are tables with proper plates and cutlery, if you can snag a spot (which we did!). Last but least, the desserts. Or breakfasts, or snacks… The fiocco di neve is a light pastry filled with delicious fresh cream – in the photo above is one from Poppella in the Quartiere Sanità. 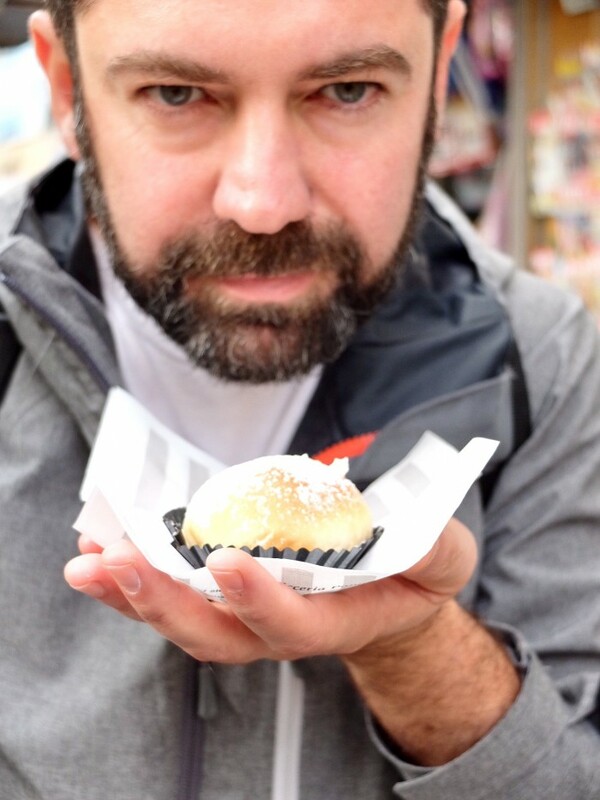 Probably more famous is the sfogliatella, in smooth puff pastry or “riccia” version which is just delightful. At breakfast for something lighter, I discovered too late in life that a cornetto can be filled with crema and amarena, and it’s delicious. Unfortunately, time was limited so on this trip we were unable to test all the best bars and sweets. I can tell you that a classic to buy your Sunday pastries or to bring them home on the train is Pintauro near Toledo station. 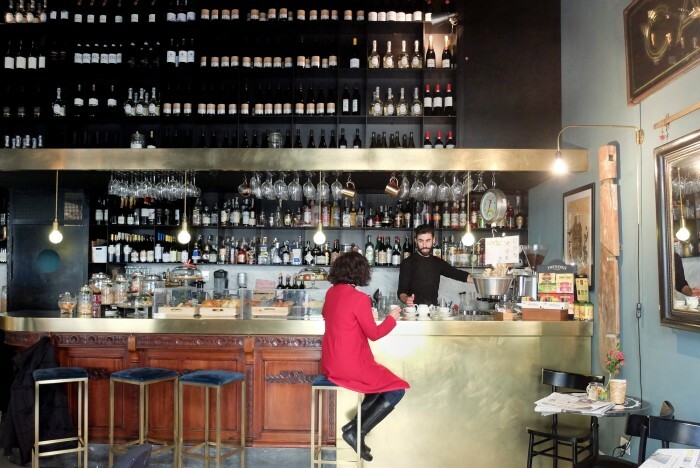 If you’re in the most central area and are looking for somewhere to take a proper break, Fiorella took us to Officina Ba Bar in via Bisignano, where Giancarlo behind the bar is a brilliant singer. You can hang out as long as you want at their tables over coffee and sweets all day, or stop by for lunch or aperitivo. Also, if you haven’t already done so, Fiorella totally convinced me to read the Elena Ferrante novels about Naples – I’d been on the fence about doing so, but she says they are truly a brilliant representation of life in the city, so they’re on my list to start soon! 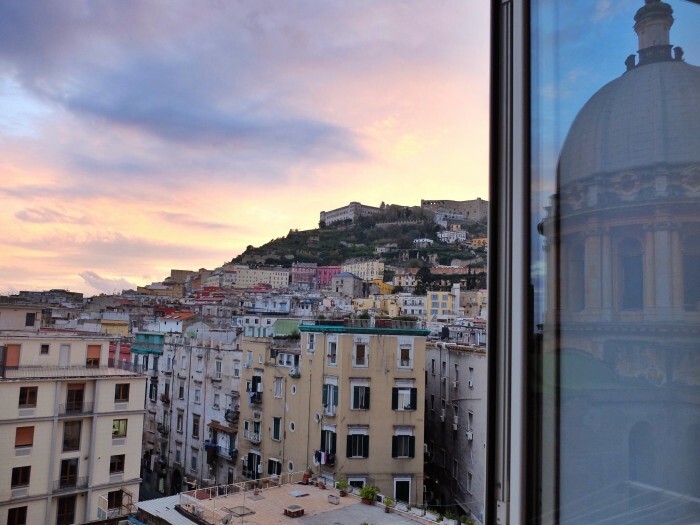 Have you been to Naples? Have I missed anything (I surely have)? Let fellow readers know what else to visit and eat in the comments!